We are a BPO company providing comprehensive Data Management Services. We have been providing niche image related services to Retail Intelligence, Retail Audit, Merchandising, Image recognition, Augmented Reality and Machine learning industries. Image Validation – It’s an important function in Retail audit industry. It requires human intervention to validate the images with data provided already. Image Annotation – This process helps to develop algorithms using training data. Images are required to be tagged or labelled for effective Machine learning and Image recognition. Image Categorization – As the word implies it is categorizing images on various headers for easy retrieval and training data. The services are offered to real estate, interior designers, glass fabricators, architect firms, Image recognition industry etc. Image Mining – It is the same process as data mining. We mine images on various topics and categories. The image mining is performed through web searches, archive folders, social media platforms etc. 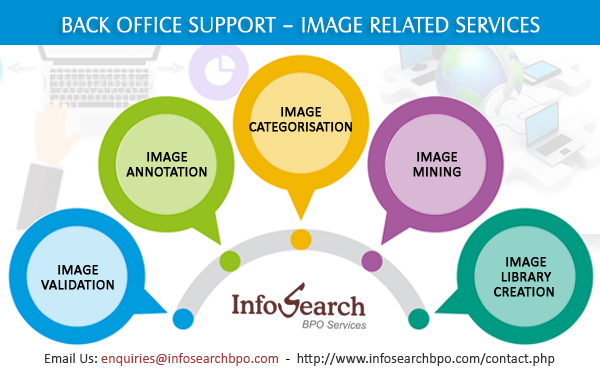 Image Library Creation – This process involves image mining, validation, annotation and categorization. It involves huge data hence human intervention at various levels are required supporting automated processes.